The 2015 Criminal Procedure Code (new Code) will grant many new rights in criminal proceedings to the accused and defendants as it comes into force in July, including the right to read and take notes of copies or digitalized documents related to accusations against them in case files after the investigation is concluded. 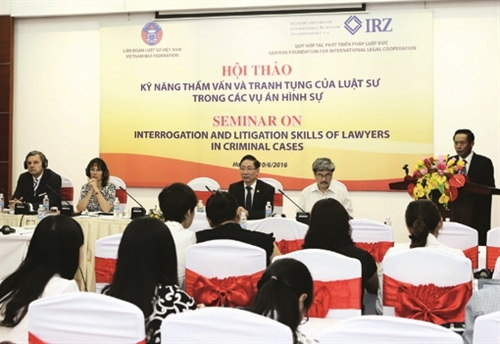 The above information is shared by Dr. Nguyen Thi Thuy, director of the Supreme People’s Procuracy’s Department of Legal Affairs and Science Management, at a training workshop held on June 20 in Ho Chi Minh City. The new Code replaces the expression “arrest of persons in cases of emergency” with “persons held in cases of emergency” to comply with Clause 2, Article 20 of the 2013 Constitution, which says no one may be arrested without a decision of a people’s court, or a decision or an approval of a people’s procuracy, except in case of a flagrant offense. Thuy said defense counsels’ early participation in criminal proceedings is also facilitated by the Code by replacing the defense counsel certificate with procedures for defense registration. Within 24 hours after receiving all required valid papers, a proceeding body must make an entry into the defense counsel register and send a notice of defense counsel to the registrant and the detention facility. This notice is valid throughout the criminal proceeding process, but not only at each stage of criminal proceeding as at present. On the other hand, the new Code obligates investigators to notify in advance the time and place of interrogation to defense counsels so that the latter can be present when testimonies of the accused are taken.